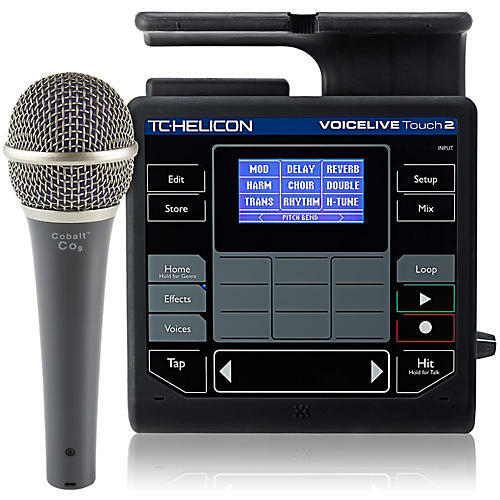 This package includes the TC Helicon VoiceLive Touch 2 and a Cobalt CO9 dynamic cardioid mic. The VoiceLive Touch 2 is the next generation in the TC Helicon compact vocal effects series. Building on the success of the VoiceLive Touch, this updated version gives singers even more opportunities to hone their instrument, create new sounds, and move the masses. VoiceLive Touch 2 gives singers unprecedented creative control of their live sound with state-of-the-art vocal effects and performance looping in an intuitive touch layout. Regardless of live performance application, sound technicians and singers alike can feel confident with this mic. A slight bass roll-off and accentuated midrange make it a world-class sound transducer for vocals.